The joyful tradition of throwing rice or grain at a newly married couple to bring good luck and a fertile union goes back to ancient Rome, so who are we to break with it? Although we do draw the line at the old Irish custom of lobbing pots and pans after the newly weds – I mean, ouch! And marriage isn’t all about cooking and washing up, now is it? The word "confetti" may come from the Italian for "confectionery" - Italians shower their newlyweds with sweets. Scraps of coloured paper eventually took over as a prettier, floatier version of rice or wheat. We have a sneaking nostalgia for those 1950s multi-coloured bells, bows, hearts and horseshoes - and they make for a beautiful photograph! 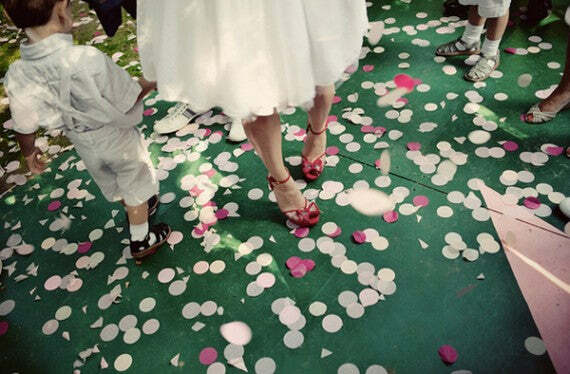 Back then, a box of confetti in your bag at a wedding was as important as having a hanky. But nowadays, tidiness and eco-concerns have rather scuppered confetti throwing, and many churches and venues ban or restrict its use. For this reason it’s becoming common for the couple to provide eco-confetti for their guests where and when they’re allowed to throw it. The positive thing about the couple providing the confetti, is the bride has quality control (always a good thing, in our view.) And she has the opportunity to create a special effect - after all, if your dream is a gentle drift of white rose petals, you don’t want someone chucking tiny shiny purple foil stars at you. Rice and bird seed are eco-friendly, but they can hit the bride in the eye or rattle down her cleavage. And they don’t float. We think confetti should flutter and swirl in a magical cloud round the newlyweds, like blossom showering down from a tree. You can bulk-buy bio-degradable paper confetti, or a whole variety of real petals, such as rose, larkspur, delphinium, or bougainvillea. Buy them dyed to match your colour theme, if you like; some of them have scents added – mmmm. We’re keen on hops confetti, too – soft green (so it blends in on the ground and the vicar can’t object) and super floaty, and the boys will like the fact that it’s a by-product of the beer making industry!